Bake Sale for Beka – join the party! UPDATE: The Bake Sale for Beka is closed. Thanks a million to Cindy C. who placed the winning bid on my dark chocolate cherry pecan cookies at $60. WOW – $60 for my cookies! I promise not to disappoint, Cindy! Thank you also to all who visited the bake sale and to those who helped raise funds more than $1,700 for the Crohn’s & Colitis Foundation of America and Camp Oasis. Great cause, great people and a great bake sale. Congrats, Megan & Beka! My good friend Megan at CountryCleaver.com is hosting a Bake Sale this weekend in honor of her best buddy Beka. Proceeds will benefit the Crohn’s & Colitis Foundation of America, Camp Oasis, and Beka’s first half-marathon where she’ll be racing for the cure. You can join the party by participating! Megan will be joined by 25 of her blogging buddies (myself included) as we bake fabulous goodies for an on-line auction this Sunday & Monday. We’re talking good stuff like Pumpkin Peanut Butter Brownies, Nutella-Stuffed Cinnamon Sugar Muffins, Coconut Oil Poundcake with Almonds & Lime, Chipotle Butter Toffee, Cheddar & Olive Biscuits, Coconut Maple Granola, Passionfruit Chili Pepper Palmiers, Neapolitan Cupcakes, Mud Hen Bars, Death By Chocolate Cookies and more! 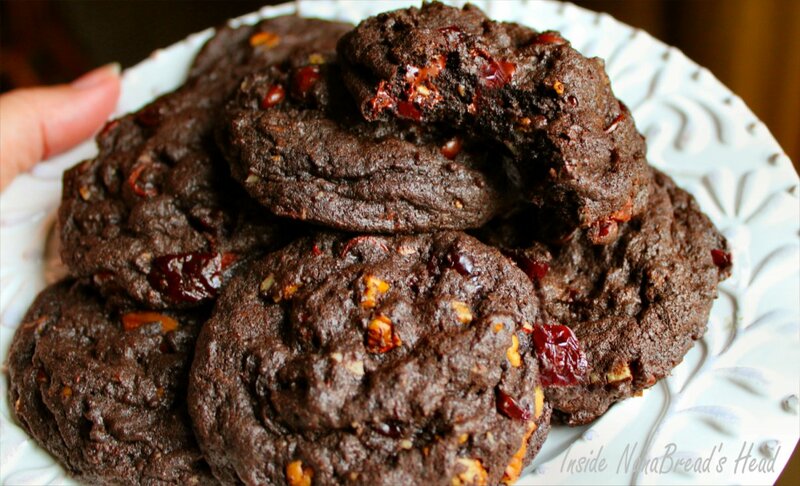 I’ll be baking my Dark Chocolate Cherry Pecan Cookies for one lucky bidder. They’re gooey, they’re loaded with dried cherries & nuts, and they are sinful as H-E-doublehockeysticks. And the best part is four dozen of them can be YOURS if you place the winning bid. Did I mention they’re really delicious?